An empty blog post screen appears. Add a title for your blog post. This name appears as the title of the post on your site. Add your blog post text. 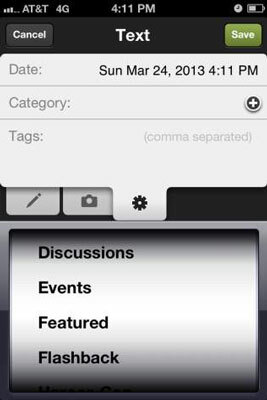 Tap in the area labeled Description and begin typing your post’s content. If you need to hide the keyboard to enlarge the area for reading and reviewing your entry, you can do so by tapping the keyboard icon. The screen shown below appears. You can snap or select only one image at a time, but you can add more photos by tapping either of the buttons again. Tap the Take New Photo button. Your camera opens so you can snap a picture and load it directly into the entry. Tap the Choose Existing Photos button, and browse to select your photo. You use this option to select a photo in your device’s photo app. Tap the Edit Photos button. 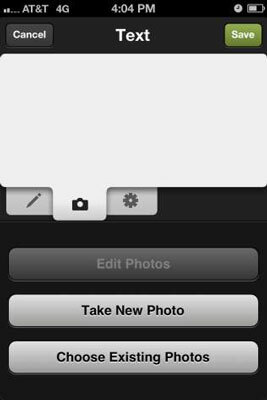 This button appears only after you add your first photo. When you tap this button, the photos begin to jiggle. To remove a single image, tap the remove icon (the X), which appears in the upper-left corner of the images. To remove all images, tap the Delete All Photos button. Tap the Done Editing Photos button. Tap and hold down on the image to select it. You know the image is selected because it will fade slightly and become bigger. Drag the image to its new location. To change the post date, tap the gear icon and enter a new date. Tap in the blank area to reveal a list of previously used categories in your blog post. If you don’t have any categories or you need to add a new one, tap the plus icon and type a new category. Tap as many categories as you want to apply to your post. Tap in the Tags area. Type one or more tags that are relevant to your post, separating each tag with a comma. Save your blog post by tapping the Save button and choosing one of the options shown below. Publish Now saves your blog post to your site so your site visitors can read it. Save Draft to website saves the blog post to your site as a draft. 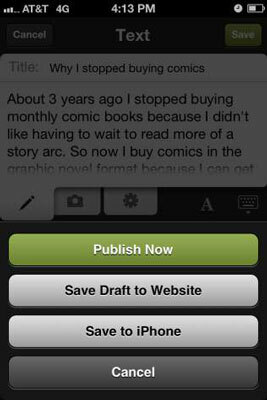 The draft appears on your mobile device in the Manage Post screen and also in the Content Manager area of your site so you can access it later. Save to mobile device (where mobile device is your iPhone, iPod touch, iPad, or Android device) saves the blog post to your mobile device as a draft but will not save it to the site. This option is helpful if you have multiple editors on your site and don’t want anyone to read the draft before it’s ready. Blog posts saved as drafts in the app and not to the site are not backed up. If your device is lost or you delete the Squarespace app, these entries will be gone forever. Cancel: Takes you back to the blog post so you can make further modifications or additions. You can also e-mail blog posts to your site and have them published automatically to your blog.